I had the joy and pleasure of meeting Sarah Ladd a few years back. She was an incredibly sweet woman, and I couldn't wait to pick up one of her books--which ended up pulling me into her first series, "Whispers on the Moors". Having thoroughly enjoyed it, I then waited for The Curiosity Keeper to come out. It recently did, so here's a small blurb and then we'll chat on the other side! Camille Iverness can take care of herself. She’s done so since the day her mother abandoned the family and left Camille to run their shabby curiosity shop. But when a violent betrayal leaves her injured with no place to hide, Camille must allow a mysterious stranger to come to her aid. Jonathan Gilchrist never wanted to inherit Kettering Hall. As a second son, he was content to work as the village apothecary. But when his brother’s death made him heir just as his father’s foolish decisions put the estate at risk, only the sale of a priceless possession—a ruby called the Bevoy—can save the family from ruin. But the gem has disappeared. And all trails lead to Iverness Curiosity Shop—and the beautiful shop girl who may be the answer to his many questions. Caught at the intersection of blessings and curses, greed and deceit, these two determined souls must unite to protect what they hold dear. But when a passion that shines far brighter than any gem is ignited, they will have to decide how much they are willing to risk for their future, love, and happiness. From the first pages I liked Camille. It was easy to see she had a less than ideal relationship with her parents--her mother wasn't there and her father wished she was a boy--but even in the face of her situation, she has a strength. Along with, what I felt, was a quick wit. She definitely can take care of herself. Jonathan is a wonderful match for Camille. Strong and caring, he winds up at her doorstep when she needs him most. This first interaction leads to him protecting Camille when she is snagged deeper into the plot of the missing ruby. 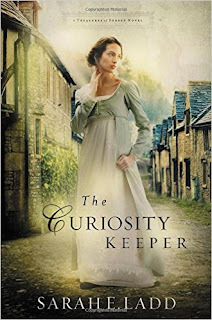 If you love this time period, sweet romances, or even a hint of suspense, I highly recommend The Curiosity Keeper. You can purchase it here. Happy reading, friends! Thanks for always sharing! You find such interesting books. I had a great weekend:) Hope you did too, Jackie!